The U.S. stock market has had a quiet week. However, the story is very different overseas, with emerging market currencies and stocks cratering. Here’s MSCI’s emerging markets currency index. Here’s EEM, the emerging markets (equities) ETF. The U.S. Dollar Index has broken out from its resistance due to the weakness in foreign currencies and foreign stocks. 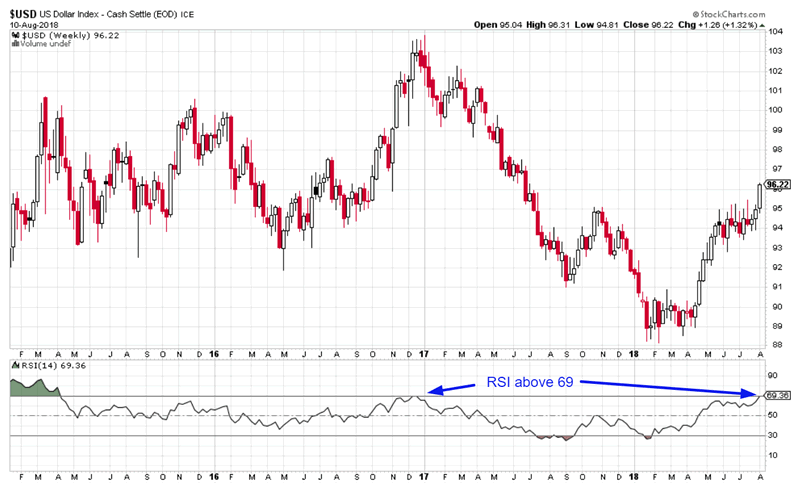 The U.S. Dollar’s weekly RSI is now at 69, which means that it’s overbought in the medium term. Here’s the USD’s 14 weekly RSI. It is now above 69 for the first time since December 2016. Here’s what happens next to the U.S. Dollar Index when its 14 weekly RSI exceeds 69 for the first time in 1 year. It tends to make a short term pullback. The medium and long term outlook is a 50-50 bet. The USD might go up and it also might go down. However, a rising U.S. Dollar is not consistently bearish for the U.S. stock market. Contrary to what financial media would have you believe, “contagion” from emerging markets to the U.S. stock market is unlikely. The financial media always seems to be afraid of “contagion”. For every 10 of these fears, contagion actually occurs 1 in 10 times (i.e. a 10% accuracy rate). Don’t bet on low probability events. 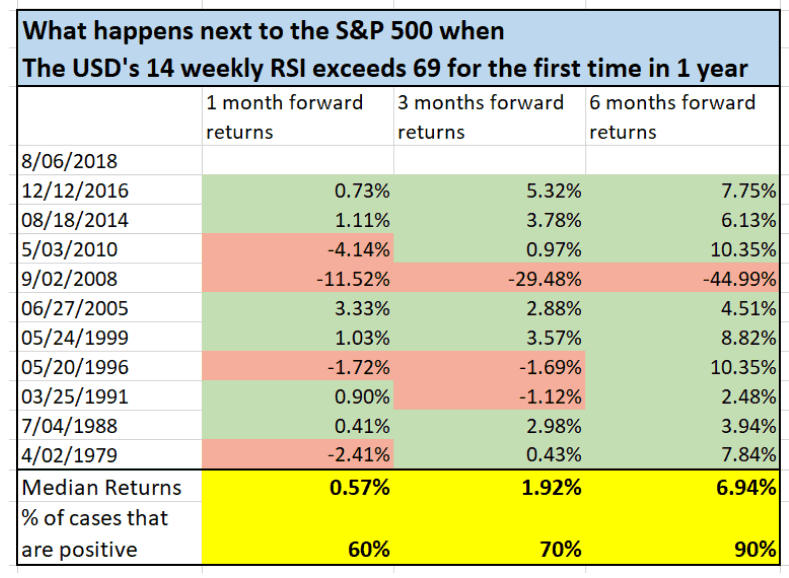 Here’s what happens next to the S&P 500 when the USD Index’s 14 weekly RSI exceeds 69 for the first time in 1 year. As you can see, when the USD rises (foreign currencies are falling), the U.S. stock market actually tends to go UP in the next 6 months. “Contagion” from ex-U.S. to the U.S. is unlikely. There is only 1 bearish case: September 2008. That case does not apply to today. The U.S. economy was in the midst of a massive recession and the stock market had already fallen -27%. The U.S. economy is growing today and the stock market is near all-time highs.